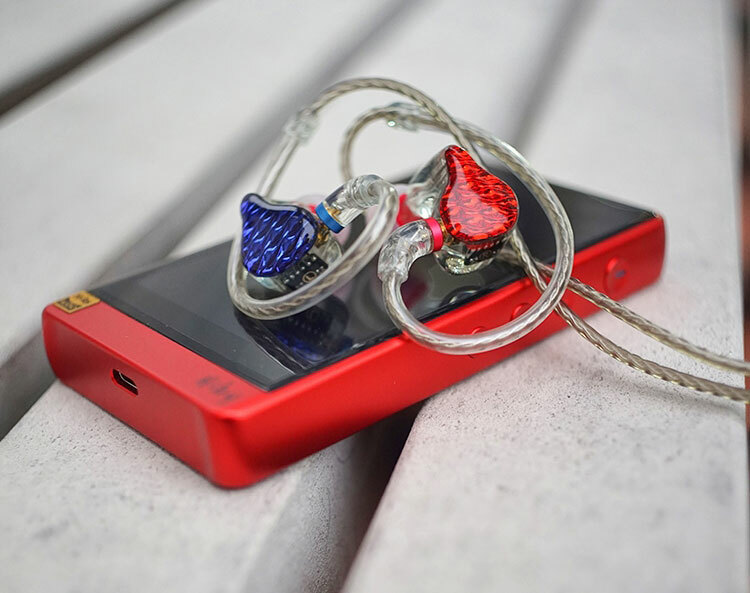 Disclaimer: The FiiO FA7 sent to us is a sample in exchange for our honest opinion. We thank the team at FiiO for giving us this opportunity. Back in Nov 2018, FiiO has quietly released a video teasing the design process of the new FA7 Quad driver IEMs featuring fancy 3D printing machinery. Following its RMAF debut, this 3D printed model with customized BA drivers has sparked a lot of interest in the community. FiiO has released hybrids and dynamic based IEMs in metal housings before but this is the first time we see high-quality 3D printing in a mass production model. 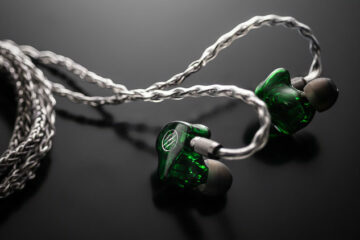 It is also their first Quad-BA IEM within the brand line-up. When I finally get my hands on the FA7 its build quality and clarity of the photosensitive resin struck me by surprise. Also, the cable and whole package seem to be quite a step-up from what I have seen from FiiO before. You think 3D printed IEMs aren’t practical and reliable? The FA7 will convince you this is not just a gimmick! 3D printing is getting popular in higher end custom monitors industry and such enables nearly any acoustic design that couldn’t be efficiently achieved by traditional handcrafting techniques. 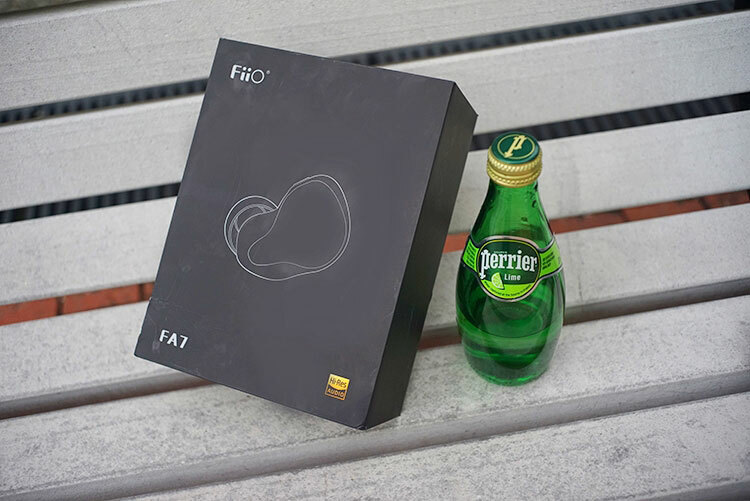 FiiO collaborated with HEYGEARS to produce FA7. This is a 3D printing manufacturer equipped with Texas Instruments DLP technology-based printers and imported EU IIA medical grade resins from Germany. Medical grade is important to prevent unintended allergic reactions when placing the finished monitor in your ear. The print job makes use of UV light sources flashing thousands of time to solidify the resin accurately ‘layer by layer’ with a stunning 25um tolerance. You will find the same technology used for jewelry sampling, dentistry, and many other industrial applications. Shown in the official intro clip you can also see the soldering being done with drivers fitted into the heat sinks. The seamless solid fill design is claimed to enhance resonance performance of the whole acoustic design of the FA7. It also seems to add a lot of toughness to the design. The FA7 is built with a 3D face-plate design with a shimmering patterns design that reflects the light. It is very mesmerizing and you may not be able to move your eyes off it for a good while. The edges on the faceplate are fused with the transparent body seamlessly. There are virtually no bubbles on the main enclosure finish. 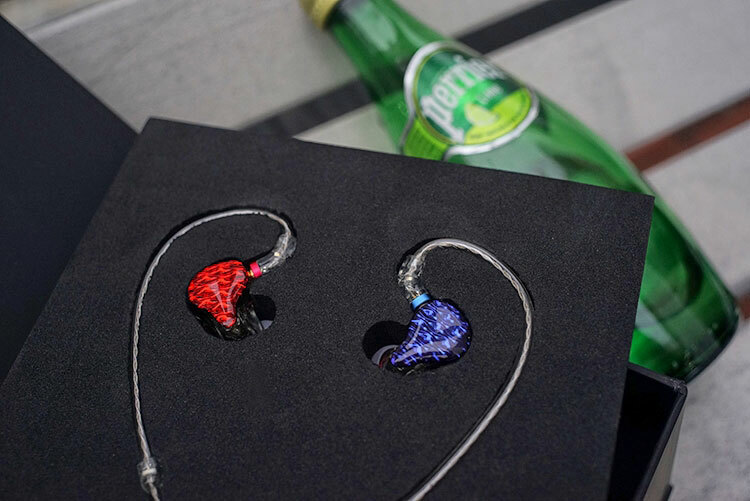 The build is very solid and design is consistent on the cable connectors using fitting molded transparent parts with matching colors to the earphone faceplates. The FA7 uses a tri-section bore that bares a passing resemblance to a Mercedes logo. The 3 ducts leading to the bore have no filters so you may need to clean the opening time to time. 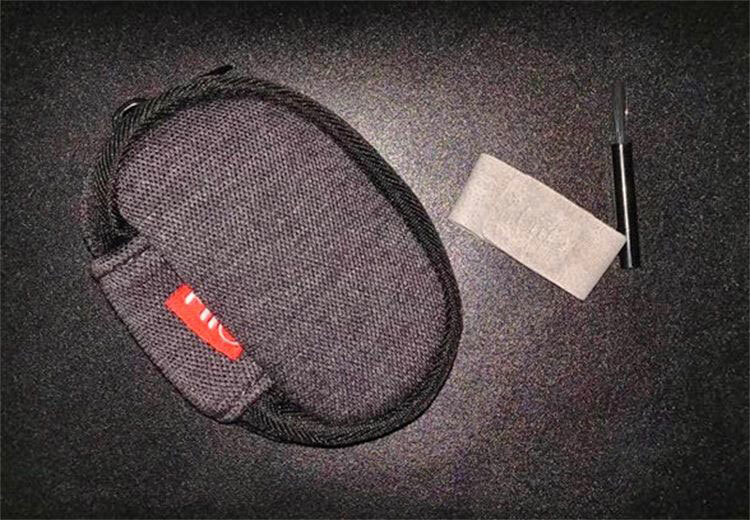 For that FiiO have supplied a cleaning tool in the small pouch in the retail package. Just in case you are wondering, they are indeed quite light at 5.3 per side despite their solid-fill build. The FA7 is available in 2 color schemes. The first is a transparent black housing with silver Prismatic patterns. The other color scheme available is transparent housing with bright red and deep blue w/ curvy shapes shown in this review. As explained by FiiO, the patterns are inspired by different forms of water. You can see the 3D design resembles ripples or still water which symbolizes the swiftness and dynamics of the sound. The Hi-Res certified FA7 is equipped with 4-way crossover, spreading the load for lows, mids, treble, and higher treble. You can see through the body and spot Knowles CI-22955, ED-29689, and a dual BA tweeter SWFK-31736. The bass driver CI-22955 is popular for its powerful bass, ED-29689 is another common selection for the mids and very interestingly a customized dual BA tweeter SWFK-31736 is developed to handle the upper trebles. It is quite impressive to see customized drivers as this is normally expected for high-end customized IEMs such as UE’s and 64 Audio. 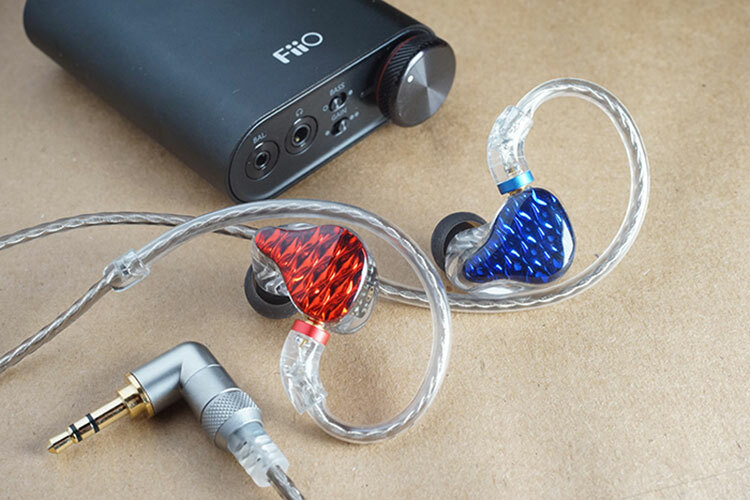 With economies of scale and the help of mass production 3D printing capacity, FiiO is achieving the same level of craftsmanship and driver materials previously reserved for more premium monitors. MMCX sockets are fitted in the FA7 and thanks to its smaller size the housing can be made smaller and more comfortable for smaller ears. The socket holds the stock cable firmly so the IEM won’t spin around while the transparent over-mold parts and metal y split/ jacks makes the cable looks quite premium. The stock cable LC-3.5B features 96 x 0.05mm cores, silver plated on copper with thick TPU shielding materials and Kevlar threading to enhance the strength. Coming with a 90°angled plug and a very thick over-ear guide this cable doesn’t put any stress on my ears, I have my sunglasses on and they still fit nicely. I like the grey silver color theme as it looks very industrial and it seems to be quite tough. 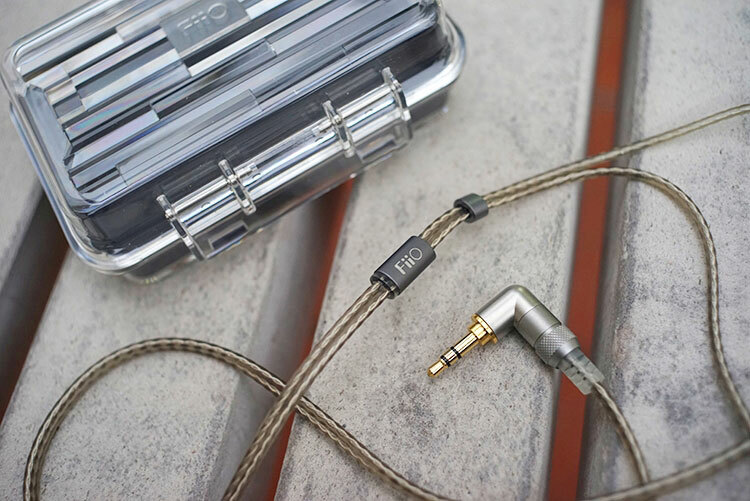 The same aftermarket cable in 2.5 (LC-2.5B) or 4.4 (LC -4.4B) termination can be bought separately from FiiO. Coming in a classy gift box outlining the earphone design, FA7 sits above a quality hard case and soft pouch. In the packaging, you will also find 13 pairs of tips displayed. 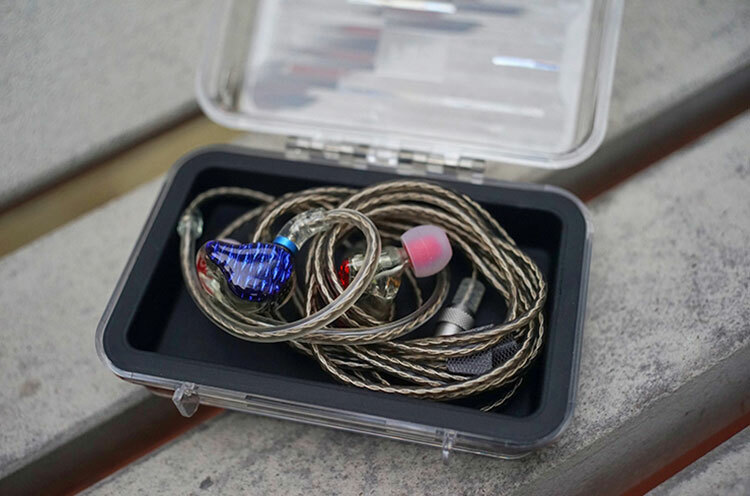 The selection of tips as a part of the tuning includes 1 pair of bi-flange, 3 pairs of tips in S/M/L size for balanced (M size are stock tips on the earphones), vocal and bass tuning. You also get 3 pairs of memory foam tips in addition to the stock tips. The hard protection case offers a good level of elements protection and looks very tough. Inside you will find a small pouch that just about fits the FA7 with tips and cable. There is also a cleaning stick for you to clean the nozzle of the earphones and a cable binder that would let you organize the cables. The cable organizer is a nice bonus you could use on other earphones and spare cables while the FA7 doesn’t really get tangled. Stated in their marketing materials FiiO hopes to deliver powerful bass, clean mids with good positioning, a resolving trebles that does not fatigue. The tuning is for modern pop rather than audiophile reference. FiiO is also pitching the FA7 as being able to handle both small and large scale music with an out of the head experience also good depth in the soundstage. Read on to see if it lives up to FiiO’s description! The FA7 is an L-shaped presentation with a fairly linear but stronger low-end emphasis and some warmth creeping into the lower midrange. From 600Hz to 2k the mids dip a touch robbing lower pitched vocals of some air and presence. You do get a decent rise from 2-3k that delivers a better higher pitched vocal and percussion focus. Female vocals in particular benefit from this rise sounding smooth and fuller-sounding with a touch of forwardness in the staging. Treble is detailed and never harsh but it lacks a little energy and sparkle. It does roll off a fairly quickly after a small 7-8k bump giving it a slightly darker tone. I ran the FA7 on an iPhone6, an AK120, and FiiO’s own M6 DAP as these are popular lower powered devices. On these pairings, I am hearing good resolution especially on the upper vocal range. The dynamic range is good with decent texture in its low-end and excellent articulation and detail in its treble performance despite it rolling-off at the very top-end. 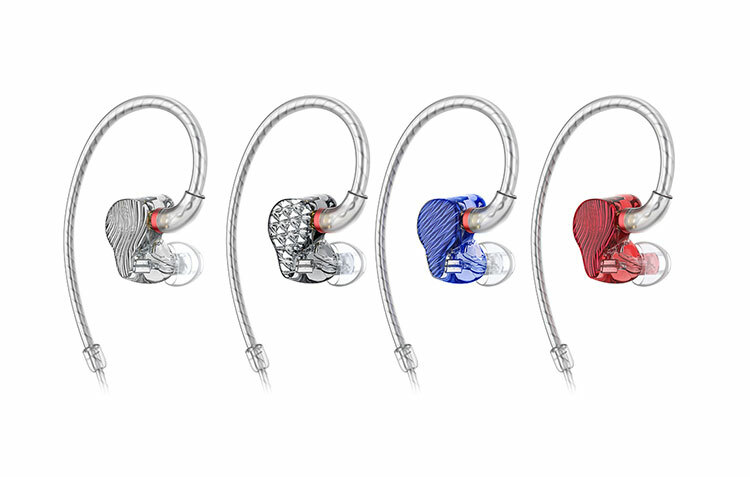 The FA7 performs well technically, yet the low-end quantity can be a bit overwhelming at times. To me, lower pitched vocals are a bit laid back, particularly male vocals which, at times, compete with that stronger bass bias. You may find equalizing down the midbass by 2-3dB effective in delivering more clarity to the FA7’s vocal presence. For this reason, I also switched to the vocal tips with a smaller bore diameter, resulting in a better treble presence and a tighter bass performance. These tips make the whole mix less bass intensive. Using the Hiby Music R6 and their MSEB DSP slider scale I also adjusted the ”Note Thickness” option to tweak it more towards my preference for more body lower pitched vocals. Again for what you are paying for, the technical capability is high and you can hear good detail in the upper-mids. There will be a better synergy if your source is more neutral or you can EQ/DSP additional weight to the vocal presence. In contrast to the bright colored design theme, I find FA7 more enjoyable with slower, emotional songs or maybe Canto/ Chinese pop songs which has more mid-bass content originally. The FA7 is rated at 23Ω with 110dB/mW sensitivity. The impedance is average and the sensitivity is fairly high. Being a relatively sensitive IEM DAPs alike the latest release FiiO M6 will still drive it loud within 50% vol. Higher-end DAPs and an additional amplifier will absolutely boost the sound quality pumping more power to the CI bass driver. The FA7 is quite sensitive to cable rolling and you could play around with aftermarket cables and try mix and match for your own preference, but for me, it is more recommended to use higher end source for a cleaner and more resolving bass performance. The slightly high impedance on FA7 make it easier to pair with higher output impedance devices for example the Hiby R6 that has 10Ω OI. The tuning will also be more consistent on different gears and it is not likely to spot any hiss from most systems with the FA7. The background is very dark on the FiiO K3 and M6 but you will hear very faint hiss on amplifiers with higher gain. The FA7 performs well with good power or a higher gain factor. Adding the Oriolus NT1 amplifier to the chain you will immediately notice more dynamics in the sound and the treble opens up with the higher power. Switching to the Hiby R6 there is more body and control for the bass, more resolution in this setup and solid vocal performance. I also manage to try the FA7 quickly on a friend’s Lotoo Paw Gold. This pairing had a good synergy with a faster bass response, better dynamic range and low-end definition as well as more treble detail. To me, pairing the FA7 with fast/ analytical sounding outputs results in the best synergy. It is strongly recommended to switch to the vocal tips once you receive the FA7 for a more up-front vocal presentation and better clarity unless you prefer darker treble, strong and soft bass. The fit and insertion depth plays a big role in what you will hear and it will be a fun experience to find a good balance between a comfortable pairing and a matching sound signature. Aftermarket tips, for example, SpinFit and Final Audio tips will also help tweak the response in similar ways to the vocal tips. I would encourage you to experiment and find a pair that gives you more comfort and favorable tuning! As the stock cable is an SPC I picked some other different materials to test on the FA7. With the HUM CX1 pure copper Litz cable, it gives even better clarity to the treble. However, some parts of the bass are strengthened and again it is too overwhelming. The upper vocal range becomes thinner as well and it starts to sound a little unbalanced. Switching to the Plussound Tri-Silver Type-6 Litz balanced cable the tuning is shaped in a more favorable way offering more texture to the lower mid frequencies and a touch of elegance to the treble. I converted it back to unbalanced and listened again and I found the balanced tuning more favorable on Hiby R6 as it makes the singer stands out more in the music. Not long ago the FH5 is pushed out to the market, carrying also 4 drivers and a different hybrid design so some may well be confused which monitor to pick. You will hear a softer and more forgiving presentation with the hybrid design on FH5 while the FA7 will offer a more analytical tuning from the mids upwards with a little more treble resolution. The FH5 clearly has a slower bass response than the FA7. However, the FA7 may still give you a false feeling of a dynamic driver’s presence rather than a larger diameter BA since the tuning emphasizes the bass. The two IEMs are very different in nature. If you want a more detailed presentation in the mids and treble you should pick the FA7 and the FH5 will be the choice for comfortable listening. As a side note, the FA7 feels way more premium with the resin build. The earlier reviewed single balanced armature earphones KOEL from Brainwavz features 3D printing technology and a lightweight design. The FA7 is much more expensive but it features a much better printing quality with no marks as if it is completely handmade. The KOEL 3D printed body has a lot more printing marks and seems untreated in the inner and outer side of the housing giving off a polished pebble smooth look. The KOEL has a more balanced signature but limited by the single driver configuration you will not hear an extended treble or as much bass compared to the 4-BA design on the FA7. I like how the KOEL is tuned and its low-profile design is great for the gym. However, the FA7 feels more premium and brings out a lot more detail. The FA7 low-end is also much punchier with better layering and more open sounding. The FA7 will handle both movies and instrumental tracks much easier, comparatively speaking. With high-quality 3D printing and industrial power to customized BA tweeters, the FA7 achieves a solid technical performance and a high degree of complexity at a very friendly price. The resolution in sound is the highlight of the design, not to mention the build quality and artistic faceplate designs. I would love to hear a less bass-focused tuning and something more reference tuned to outpoint the FH5. Otherwise, the FA7 is a good recommendation for entry/mid-level users and for those who like a slightly dark but forgiving presentation for modern music. How about the soundstage compared with fh5? And how its sound compared with similar price Oriveti New Primacy?